How time flies! 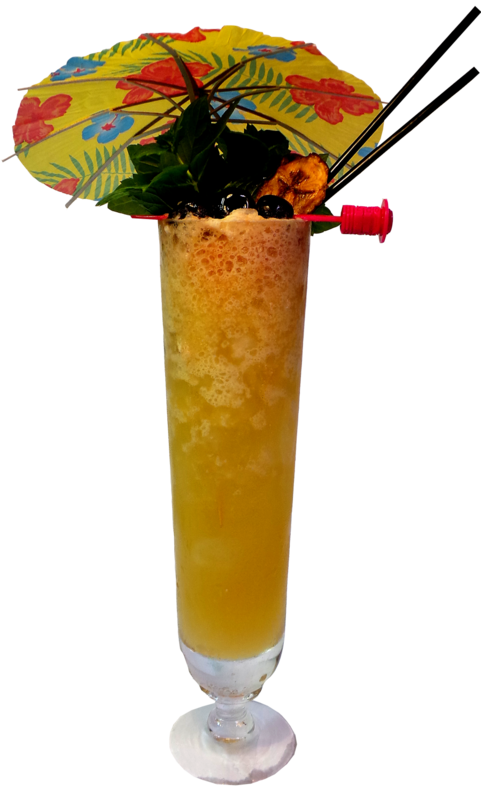 we`re already in mid february and the Tiki Month is halfway through…. 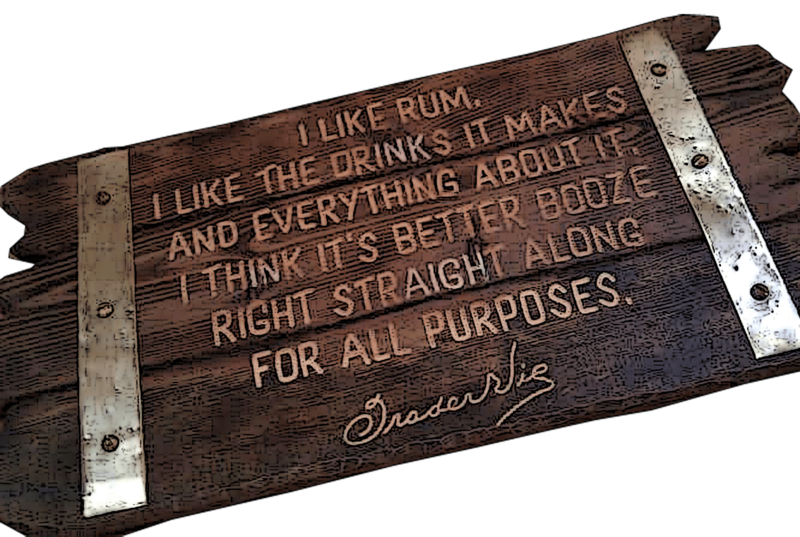 And then I found this post…..it´s called “How Tiki Month Began” – where he tells the story of how it started…it took me back to the golden days of tiki blogging….such nostalgia! incredible! it was a different feeling those days, it was a feeling of discovery, adventure and brotherhood among bloggers (and yes we even had our own organisation called the Cocktails and Spirits Online Writers Group with the likes such as Kaiserpenguin, Cocktailnerd and Dr Bamboo… The CSWOG was the 25 most prolific cocktail blogs at the time, come together doing events, both on and offline. Our signature drink was a communal style JWray overproof spiked Chartreuse swizzle served in flower vases. I had no IDEA how much Doug looked up to us early tiki bloggers! and from having no tiki drink experience whatsoever to decide to go a whole month doing ONLY tiki is an amazing task to take up – and look at him now, almost ten years of tiki month blogging, and the research he have made and put together is incredible….go and read this post and all the others on his blog, Tiki Month 2017 in full swing! I have to give kudos to Doug for keeping it up for so long and I hope it won`t close down anytime soon. There`s a video of Doug`s volcano, Mount Pegu – I posted it at last year`s Tiki Month, you can watch it here. 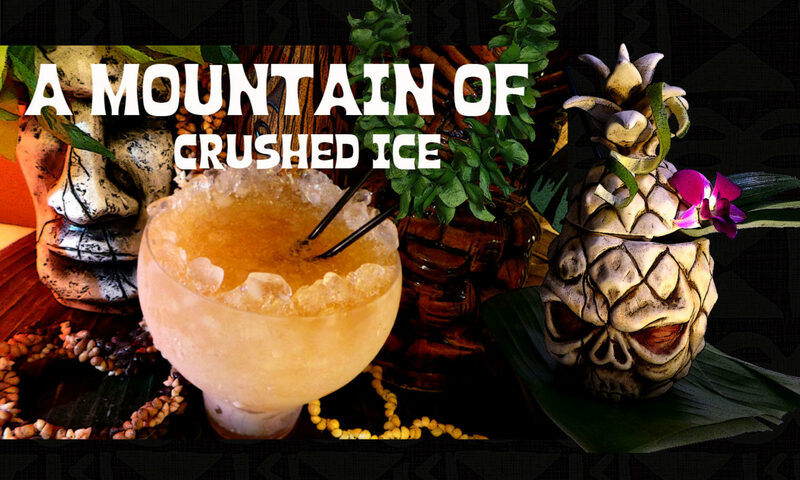 I have admired his volcano for a long time, ever since he built it and I believe it must be pretty fun to have your own indoor volcano with erupting smoke and all, making your home tiki bar come alive! For this drink I have put together rum, hibiscus grenadine, Cherry Heering, fresh lime, grapefruit and passion fruit. It was kind of too fruity and weak to me in flavor when I first made it but after adding Lost Spirits 61% Navy style rum the drink was kickin`and there came some depth of flavor. 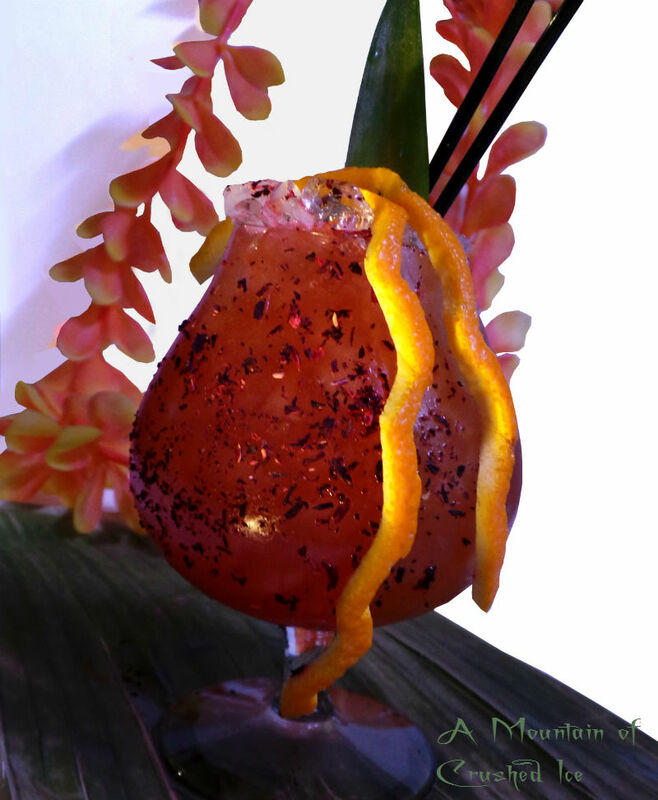 Garnish – Dried hibiscus powder, two long lemon peels cut to look like lava streams, a pineapple leaf. Add some lime juice on the outside of a snifter and sprinkle hibiscus powder on it. You can make it yourself by crushing dried hibiscus flowers in a mortar. Blend the ingredients in a blender at high speed for 5 seconds with 4 oz crushed ice and pour into a snifter, add more crushed ice to fill and the two lemon peels. Sprinkle some of the hibiscus powder on top of the ice and add 2 straws. Happy Tiki Month! next year we celebrate 10 years! !